RACERITE offers full professional timing services using the latest technology. Our friendly, professional staff will make sure to understand your event and your needs. We are proud to offer a range of cutting-edge timing services unmatched in Colorado and surrounding areas. Full-service chip timing. We time triathlons, duathlons, running, cycling, mountain biking, snowshoe, and nordic races. Timing Equipment. High performance re-usable chips, or convenient disposable bib chips, your choice! Online Registration. We will setup online registration for you with our partner at no cost and no trouble to you. Race Promotion. We will promote your race at our website via our Calendar page and/or Featured Events section on the main page. Race number bibs. We can provide stock race number bibs at no charge (if available), or custom bibs at cost. Data entry. 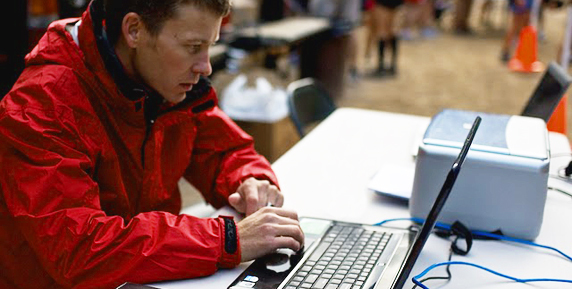 We offer data entry services for all race day registrants and mail-in paper forms. Searchable Online Results. Our results site is modern, searchable, and easy to use. 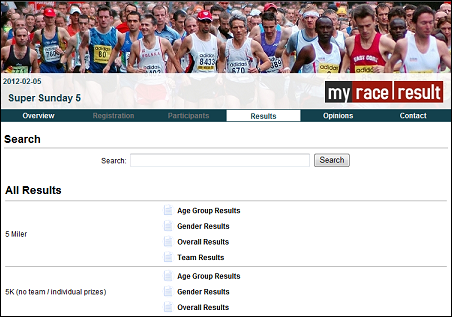 We can post separate results for Overall, Age Group, Gender, Team, or anything else. See example below. Live Online Results. We can post results online in real-time during your event. This includes splits from remote locations if desired. Finisher Certificates. 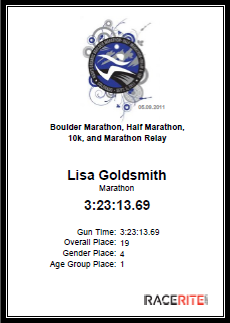 Custom-designed Finisher Certificates are always available online for your participants to print at home. This is a standard free service! Finisher Certificate Printing Kiosks: self-serve kiosks so finishers can print their own Finisher's Certificate immediately after finishing. Instant Results Kiosks: self-serve kiosks so finishers can print a quick receipt showing name, time, splits (if available), and place. Live Leaderboard displayed on a 32" HDTV, projection screen, or Jumbotron. We will customize these reports with your logo! RaceRite Timing - Demo 1 - Live Leaderboard from RaceRite Timing on Vimeo. Announcer Feed: real-time finisher info appears on an iPod Touch, tablet, or laptop, so your announcer can read names, times, places (and more) as finishers cross the line. Text Messaging: finish times and/or splits sent via SMS text messaging to participants, friends, and family. Printed results posted at Race Event site. Results posted online within hours of event completion. If we have mobile coverage at the event, we normally post results before packing up.